In the War Between. 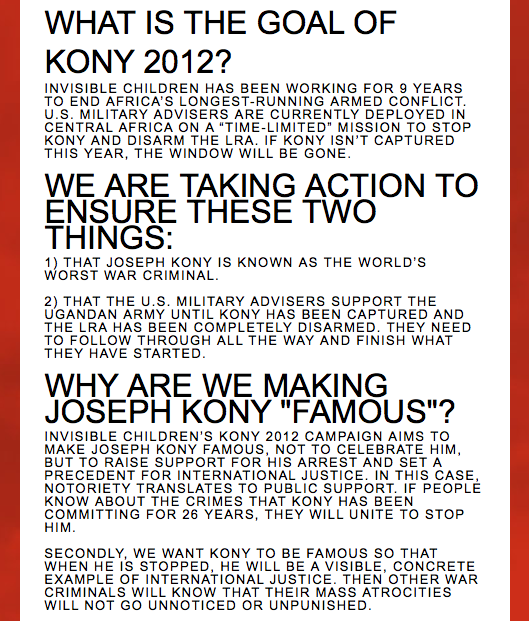 : Kony 2012. I get it. The video is moving, enraging, uplifting, and ultimately inspiring. But is it a piece of manipulative garbage, produced to tug at the empathetic heartstrings of the optimists all the while padding their falsified "charity" organization? Are they simply really great filmmakers hoping that the public will donate money that will write their exorbitant paychecks? The backlash from this video has been incredible. While I applaud the people backing Invisible Children for getting off their asses and fighting for justice, I am aware that it takes willingness as well as aptitude to get anything accomplished. Blind rage, blind vengeance, and blind faith are limited in longevity. There are many sites, many articles, many charitable organizations, and many political science essays that are extremely important to read and research before tens of thousands of dollars are accumulated with little established direction. The problem in Uganda is bigger than one man, but what they are trying to do and the passion we as a civilization are capable of feeling astounds and amazes me. I hope people ARE energized. I hope they DO get involved. I just hope they also approach this, and everything, with a critical mind. While bandwagon jumping and "slacktivism" is rampant and easy, I am more fascinated and intrigued by the effect this campaign has had on our passions and our sense of global connectedness and our desire to help our fellow man. The internet is rife with articles and essays and posts either praising this organization or condemning it. There are facts about their legitimacy, their transparency, their history. And I could read until I was blind and couldn't tell you with certainty if this social call to arms was a brilliant movement or a sick networking experiment that showed us what hopeless sheep we really are. But here are their financial statements for 2011. While I can never say for certain what motivates another individual, I do know what happened to me when I watched the movie. I allowed this video to raise my own awareness to a level of much needed urgency. Not just for this particular cause, but in the personal sense that I have let the minutiae of daily stresses cloud my empathy for others. I have forgotten to get involved in something bigger than me for some time. It angers and disappoints me. I am in awe of others who are always on top of their sociopolitical game, so to speak. I used to be. I used to bombard myself with the plight of others. I just kind of... forgot. But I love the feeling I get when I see people come together to influence positive change. No, most aren't always completely informed or doing it for the "right" reasons, myself included depending on who you ask. But the fact that when they see injustice they are moved to action makes me ridiculously inspired. Because we DO care. People know that there IS hope and we ARE worth protecting. And this little piece of film engaged that side of me. Perhaps those heading Invisible Children are manipulative and maybe I am emotionally naive... but I am grateful for the newness of unity I feel after having watched it and the renewed sense of connectedness I now feel. If a poem motivates a man to go boldly in the direction of his dreams, is it all meaningless when he finds out the words were a lie? I am appreciative for any and all inspiration. Even if this movie only inspires me to investigate the other information and all of the other charities that are involved in this particular case, then I would be at peace with that. And as far as I'm concerned, the movie has done what I want it to- maybe not what they wanted it to do but at least what I want it to. I mean look at us right now- everybody's talking about this movie. People who have never even heard of Uganda before are now aware of what's going on. People who haven't read any of the articles, haven't seen any of the websites, haven't heard of any of these charities, are now reading up on them in droves. And as far as I'm concerned if that's what this movie encouraged us to do, then I am grateful. I don't know how legit this campaign is or what the true story is in Uganda. What I do know is that this movie should be the FIRST thing you read on the subject. Not the last. This is perfect. THANK YOU for putting into words what I could not.